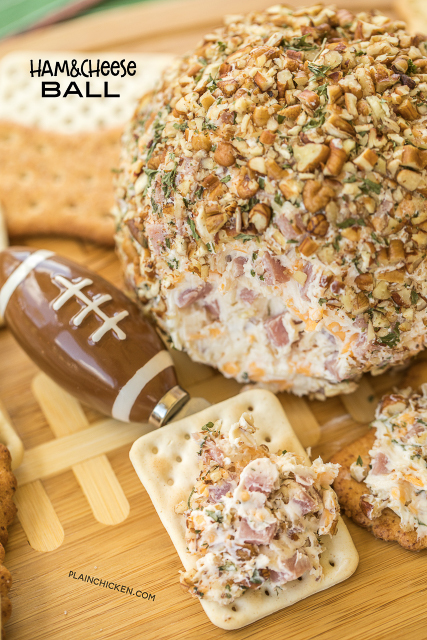 Ham and Cheese Ball recipe - dangerously delicious! Great for tailgating and holiday parties!! Ham, swiss, cheddar, cream cheese, dijon mustard, worcestershire, brown sugar and a little onion. I'm totally addicted to these flavors! Can make ahead and refrigerate until ready to serve. 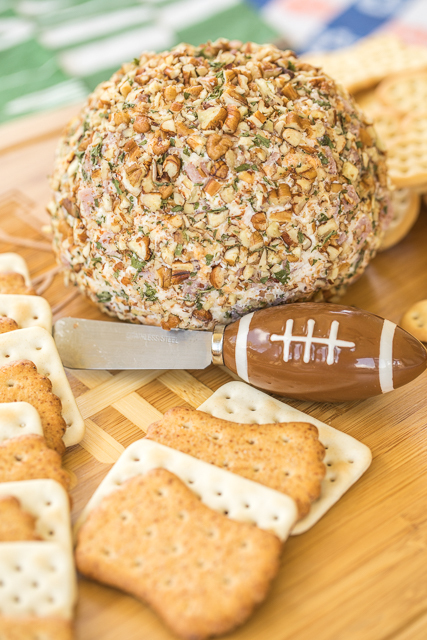 Cheese balls are a favorite at tailgates and holiday parties. I love that they can be made in advance and they taste great! This Ham and Cheese Ball is a new favorite. I've made this several times over the past month, and I just can't get enough of it! I am addicted to the flavors! Ham, swiss, cheddar, cream cheese, dijon mustard, worcestershire, brown sugar and a little onion. OMG! YUM! I served this Ham and Cheese ball with some crackers. It would also be great with some celery or bell pepper slices if you are watching your carbs this holiday season. 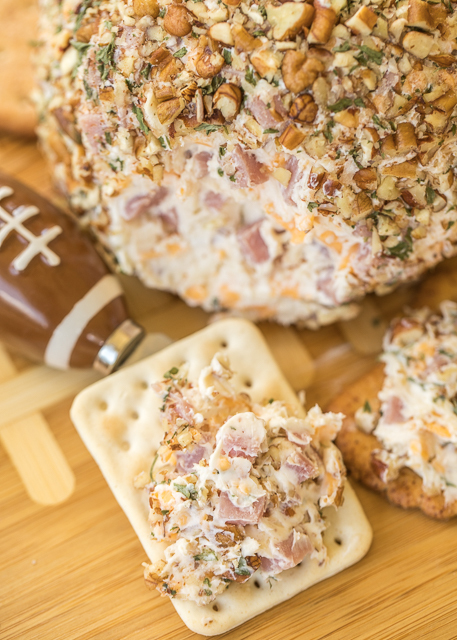 This Ham and Cheese ball will keep for at least a week in the refrigerator. Mine never last that long! This recipe makes two cheese balls. 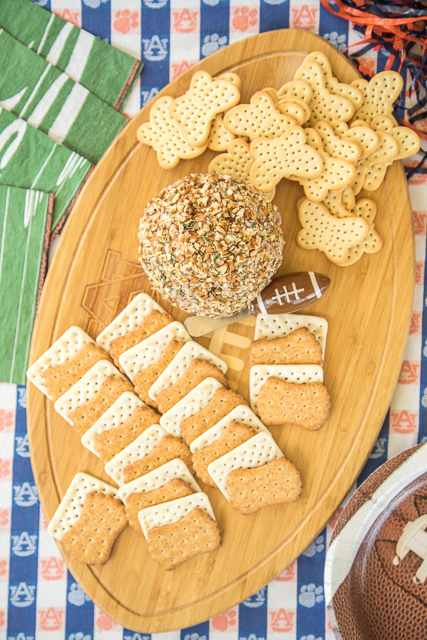 Perfect for tailgating and SUPER BOWL parties. You could even roll these into mini cheeseballs so everyone has their own personal appetizer. Combine ham, cheddar cheese, swiss cheese, cream cheese, dijon mustard, Worcestershire sauce, brown sugar and onion powder. Divide mixture into two portions and shape into balls. Cover with plastic wrap and refrigerate until firm. Remove cheese balls from plastic wrap and roll in chopped pecans and parsley. 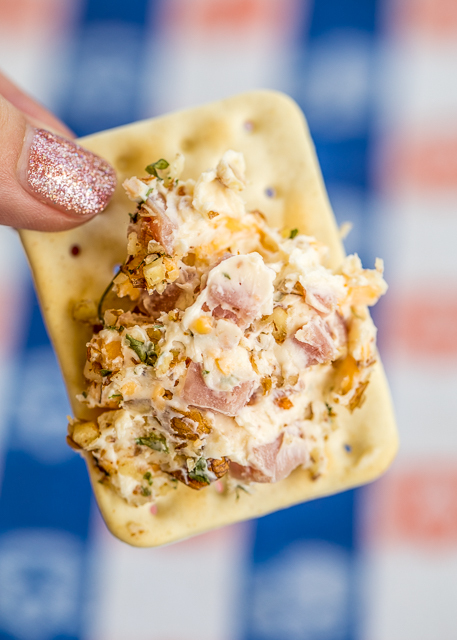 This looks so good, it will definitely be on my Super Bowl snack table this weekend! Hi, nice recipe! About the cream cheese, do you mean 2 packages of 8 oz each, or 2 packages, in total 8 oz, so in 4 oz each?